Back at Bata's Guesthouse in Moron, we agreed to join up with other tourists who were trying to make their way south, to Terkhiin Tsagaan Nuur (Great White Lake). 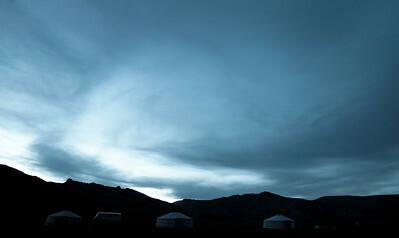 Not an unpopular destination, the lake is usually approached from Ulaan Baatar and not from Moron in the north. It took three days of waiting before Bata could convince a driver to drive us the few hundred kilometres to the lake. He didn't seem overly happy about his decision. It took most of the day to get to our destination, where we settled into an inexpensive family-run ger camp for the night. In the evening we were roused from our ger cots by the sound of a blow-torch. 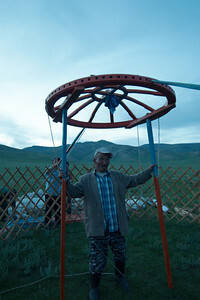 Having read about the use of blow-torches in Mongolian cooking I excitedly dragged Yann out to take a look. A small crowd was gathered around the hunters/chefs who had already pulled out the insides of the marmot and replaced them with hot stones and sewn the whole thing up. The stones cook the marmot from the inside, while the blow-torch burns off its hair and crisps its skin. I stood around watching as Yann ran off for a toilet break. Before Yann returned, the cooking was complete and I was handed a nice chunk of marmot fat with a thin outer layer of crispy skin. I made sure to show my appreciation by sampling the crispy skin, but I left the best part for Yann. 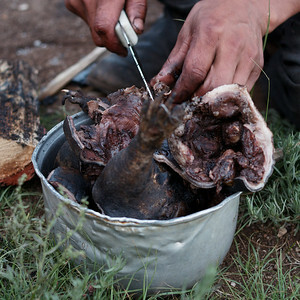 Eating marmot was a special test of our travel etiquette, we knew that in Mongolia, marmots can carry the bubonic plague. As the meat was being parceled out, the hot stones were passed around between the men, I can't remember if this was for good luck or for virility, I just remember someone telling me, as they handed me the stones, that women weren't really supposed to handle them. The mood was festive as people gathered around for their share of the meal. There seemed to be quite a few people coming to eat, considering the small amount of meat. Despite the plague risks, we were grateful to have been offered a piece. To finish off a great evening, we watched the men of the camp successfully, albeit slowly, put up a ger while intoxicated. With the opening of a marmot-hunting season, Marmot Boodog becomes a very popular and fun outdoor activity for Mongolians, especially men. Marmot hunting and boodog cooking is a prerogative of men. A freshly killed marmot is separated from intestines and cleaned. Then, a prepared marmot is filled with preheated hot stones and tightly sealed. The marmot meat is cooked by the heat of stones from inside. Additional heating is provided by open fire or gas burner. The same amount of precaution as described above must be used for handling the marmot cooking process. 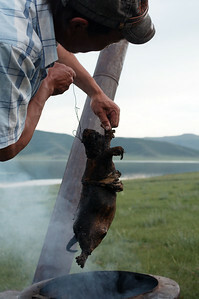 When done, the marmot meat is very tender and tastes like wild duck according to some foreigners. Clean the marmot, separate the intestines and slightly remove hair from the skin. Rub the inside with salt, fill up with hot stones and seal tightly. Additionally, roast the marmot on slow open fire or with a gas burner. 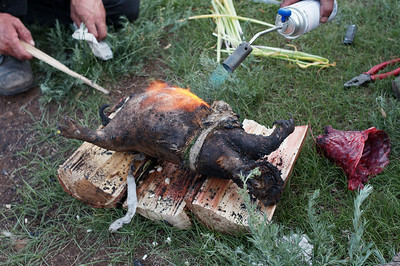 Usually, Mongolians do not use seasonings in order to keep the specific taste of marmot meat. When the cooking is done, the stones are pulled out, rolled in hands, the meat is cut into pieces and served hot. hmmm don't think I'll try that recipe, but very interesting. The photos of the landscapes on your horse trek are stunning!